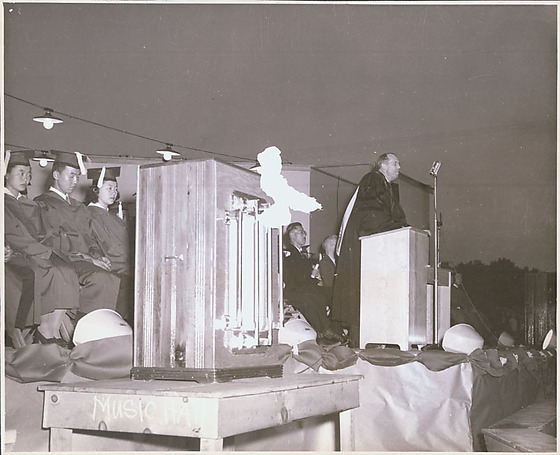 1 b&w; image of speaker at graduation ceremony for Manzanar High School. 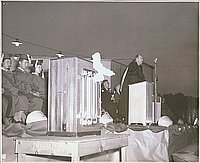 Man is at podium on a stage speaking. Graduates in caps and gowns sitting on stage behind him. Footlamps visible at BR. Overhead lights strung above graduates. L side large box shaped item resting on a platform marked on the side, Music Hall. Typewritten on piece of paper attached to scrapbook page is long quotation reads: "In years to come, when the war is over, and peace has returned to the world, people may say to you 'What was Manzanar'. Then I hope you may say that Manzanar was a war time city that sprang up from the sands of the desert of Inyo and returned to desert with the end of the War. It was the largest city between Los Angeles and Reno. It was a city serving a War time purpose where people lived in peace and good will, where schools were of as high a rank as other California schools, and where students dedicated their future lives to the American way of living. I hope you may say that that [sic] Manzanar was an experience worth living, where the important realities of life were made clear and where there was time and opportunity to prepare for participation in the work of winning the peace based on tolerance, understanding and good will. The graduates of Manzanr [sic] have a great contribution to make in determining the kind of world that is to come after the War." Typewritten on piece of paper attached to scrapbook page is long quotation, see description superfield.